On December 15th, 2012 at Islington Assembly Hall, London, we played a 21-song set in front of a sold-out crowd of 800 people to both celebrate our time with and mourn the depar- ture of Ellen Campesinos! as a member of Los Campesinos!. It also marked the first time we were joined onstage by Aleks Campesinos! since her departure from the band, to return to her studies, 3 years ago. This was a once in a lifetime LC! gig. One which we enjoyed playing immensely and are delighted to be able to share with you in the form of this live album. We hope that you enjoy listening to it and that if you were there on the evening it brings back floods of good memo- ries. If you weren't, I hope it hits you with pangs of jealousy, and that we will see you front and centre at a show in the not too distant future. 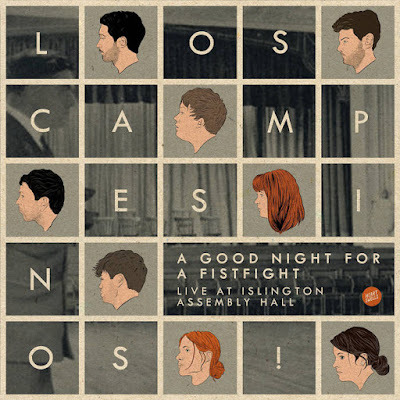 A Good Night For A Fistfight (Live At Islington Assembly Hall) by Los Campesinos!